Backbone.js is a JS library that provides models with key-value bindings and custom events, views with declarative event handling, and collections with an API. Furthermore, there are many web platforms that use Backbone.js to build their front-ends. Such platforms include Trello, Bitbucket, Foursquare, SeatGeek, and more. The documentation is very comprehensive. I'll give a basic overview of these concepts to nourish your understanding of Backbone.js. A Model is a layer that transforms and syncs data with a persistence layer (mostly RESTful API interacting with a database). They contain all the helpful functions needed to manipulate some piece of data from the persistence layer. When any of its data is modified, Models trigger change events. Consider a Model as a sort of manipulator. Instead of directly interacting with the data from your API, it serves as a layer that allows you easily manipulate every tiny piece of data in a very friendly and fantastic way. Here's a simple case study: Imagine we are in charge of a gift shop and we need to build a database of the gifts that we sell. We need to keep track of the stock of those gifts. Details like the price, brand, stock, and type. Let's look at another practical case. If we need to create a new user on the backend, we can instantiate a new User Model and call the save method. Collections are ordered sets of models. You can bind some events to be notified when any model in the collection has been modified. Events such as change, add, remove. Let's create a Backbone collection and add models to it. To access the models in the collection, you can use each, one of the Underscore methods available to loop over the collection and present the data to the screen. During the iteration, you can perform model methods like get/set on each model. Other popular methods you can use on a collection are toJSON and sync. The views listen to the model "change" events and react or re-render themselves appropriately. Note: Templates allow us to render the User Interface as an alternative to direct DOM manipulation. Events is a module that can be mixed into any object, giving the object the ability to bind and trigger custom named events. Let's try something more practical. Say we have a UserModel. In the code above, the user model will now listen to change events on itself. Once you set the name to another value, it triggers the change event that calls the someChange function. In Backbone, you can also listen to just a specific attribute change. For example, we can listen to only title attribute change. How? We simply chain it with a colon like so: change:title. The change event is only triggered whenever the title changes. And then calls the someChange function. We also have built-in events that occur on collections. Check out the catalog of built-in Backbone events. 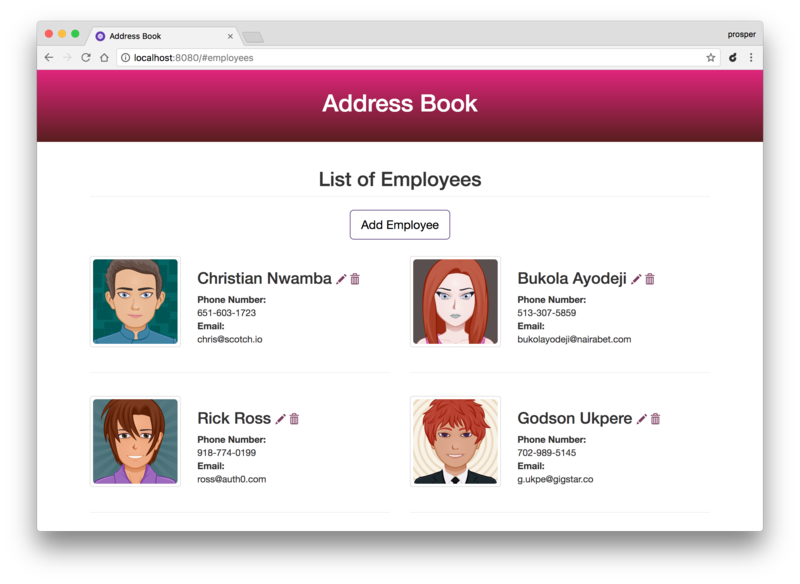 The app we will build today is an Address Book. This app simply manages the address of employees in an organization. We won't make use of any backend but will take advantage of Backbone Collections. I'll leave you to persist it to a backend or use local Storage. We'll need three main dependencies, Backbone.js, Underscore, and jQuery. Go ahead and create your app directory. In the root directory, create an index.html file. Also, create css, and js folders within the directory. Inside the js directory, go ahead and create the collections, models and views directories. Let's analyze the code above. We have three template-type scripts. One for displaying the list of employees, another for editing and creating new employees and one for displaying the link for creating new employees. Furthermore, we referenced jQuery, Underscore, and Backbone libraries. We also linked some views and script files that do not exist yet. We'll create them soon. Finally, there is a startup function, EmployeeManager.start(), that takes in an array of employees for display when the app is started. You'll understand how this works in a couple of minutes. Next, open up the models directory and create an employee.js file. We just set the defaults of our model attributes to null. In our app, we are not persisting anything so our model will be very simple. Earlier I mentioned that collections work with models. We'll have three views. One view for handling the list of employees, one view for the details of each employee and one view for adding employees. Let's get started. Go ahead and open up the `js/views` directory. Create a file, `employee.js`. This is the view that handles the details of each employee. In the code above, we have the HTML tag, <li> that is assigned a class. This is the element that houses the employee detail. The render function ensures that the right data is appended to the template and displays on the page. The onClickDelete function is for removing the data from the model and collection. The events object simply maps the onClickDelete function to the click event of the delete-employee button. Next, create the add employee form view. Create a file, employeeForm.js in the js/views directory. In the code above, the onFormSubmit function is called when we submit the form. And this function is called whenever the submit event is fired. The render function assigns the model to the template. Finally, create a file, employees.js in the js/views directory. This view is responsible for the list of employees on the page. Remember the EmployeeManager.start() function that was called in the index.html file? The function houses the events that the router listens on. 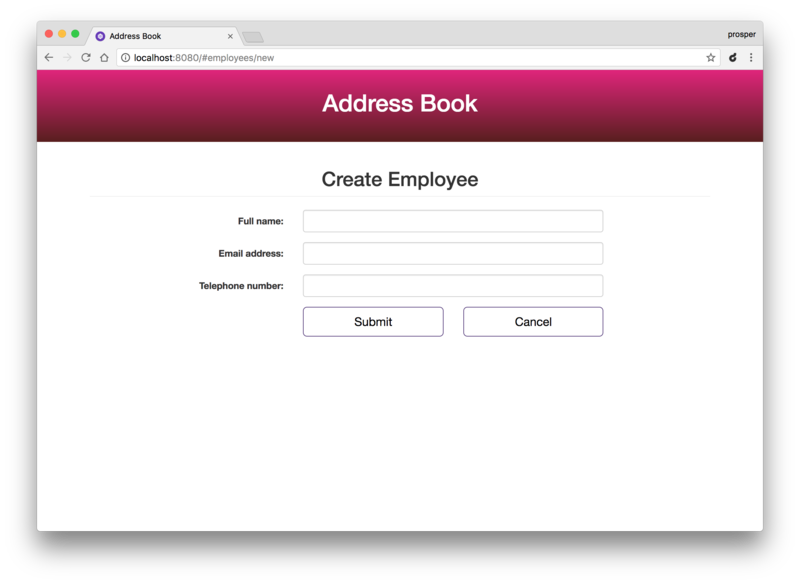 Whenever the user launches the app, the router listens on the home event, and triggers a redirect to the employees route. Whenever the user hits the #employees route, it listens on the showEmployees event and renders the list of employees. Whenever the user hits the #employee/new route, it listens on the newEmployee event, renders the form for adding new employees, and handles the form submission. Whenever the user hits the #employees/edit/:id route, it listens on the editEmployee event, and renders the edit form. Backbone.history.start() is used to allow the use of hashbangs for the routes. How Is Your Application's Customer Service Experience?